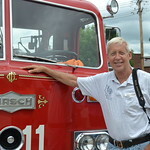 THIS SITE IS A HISTORICAL LOOK AT THE VEHICLES THAT SERVE THE ILLINOIS FIRE SERVE. THIS SITE IS DEDICATED TO MY LONG TIME FRIENDS MARK MITCHELL, JEFF SCHIELKE, GEORGE REICHHARDT AND DON FEIPLE. A SPECIAL THANKS TO JOHN FIJAL, BILL FRICKER, FRANK WEGLOSKI AND JONATHAN SUDKAMP FOR HELPING BY SUPPLYING PHOTOS FROM DOWN STATE FOR THIS SITE. THE CHICAGO FIRE DEPARTMENT IS BROKEN DOWN BY BATTALIONS - SPECIAL OPERATIONS UNITS AND THEN THE DOWN MEMORY LANE GALLERIES. ALL OTHER ILLINOIS FIRE DEPARTMENTS ARE ARRANGED BY COUNTY AND THEN INDIVIDUAL DEPARTMENTS. I WOULD REALLY LIKE YOUR FEEDBACK?